Geotripper: Domestic Mammals in the Field? The question of the day concerns animals in the field...catch posts here and here. I was immediately reminded of a long-running discussion between my son and I about cows and whether cows are planning to take us over as the dominant species on the planet (recall the dolphins and mice of Hitchhikers Guide to the Universe). Some people think our country will be taken over by black helicopters; my son is more convinced it will be black cows. During an exploration of some wild caves in the Sierra Nevada foothills, I found my assumptions about chickens to be wrong. Rounding a corner, we were faced with a vanguard of the coming invasion...I had the same feeling that King Arthur must have experienced when he met the Knights Who Say Nit (Monty Python's Holy Grail), or maybe the white rabbit. Seriously though, there are some great caves in our neck of the wood. I have a smattering of photos posted here. One of our Sierra caves (Lilburn in Kings Canyon National Park) has something like 17 miles of passageways. Info on caves of Sequoia and Kings Canyon can be found here. Nothin' quite like a cow for REALLY STARING you down. It looks like your son may be right! 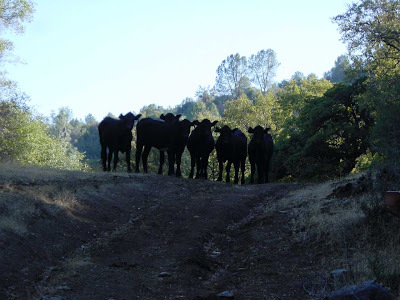 I suspect the cows were thinking "What do you mean you didn't bring us any food?" My pickup truck was set upon by a bunch of horses one time in the Jarilla Mts. of southern New Mexico. It seemed that they were expecting us to have brought them some apples or some sort of treat and when we walked away to check out an old mine, they set about vandalizing my truck. They chewed on the door handles, the windshield wipers, the camper shell handle, and one kicked and shattered the passenger-side mirror. On the non-domesticated side, there was a story going around the North Georgia mountains a year or two ago about a grouse repeatedly attacking mountain bikers along a particular trail. It's a jungle out there, even in the desert.